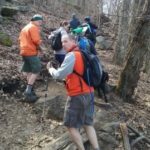 I wanted to start our blogging by talking about the Journey to the Appalachian Trail. The Journey really began decades ago. As a young college student, I could still walk some. As a freshman, I walked on the trail a little bit. I told myself that I would go back “some day.” But a lot of life happened along the way. The physical challenges mounted. I didn’t pine for the Appalachian Trail. I pushed it into my subconscious and didn’t think about it at all. At least that’s what I thought. But it was always just below the surface, mostly focused on the northern end of the AT: Katahdin. But how could someone who couldn’t walk hike or climb? It was impossible, a waste of time and energy to think on. I loved teaching, my life was full and fulfilled, and I was happy and content. Then in October 2012 I experienced a catastrophic bleed that nearly killed me. No one thought I would survive. I lost so much blood that I lost my ability to move or to speak. It was much harder to relearn how to speak than how to move. During the long rehab process, I had plenty of time to think. I had been given a rare gift: a second chance at life. Teaching alone was no longer enough. I had to pay it forward and backward. I was so extraordinarily lucky—I needed to share that luck, that gift. But how? Part of my luck is that I get a lot of ideas. Some are fleeting. Others come, stay, and won’t let go until I act on them. I’ve become comfortable with this. I work with lots of students who struggle to communicate. They have lots of self-doubt. I was always telling them that nothing was impossible, that they can do anything that they set their minds to. But saying this was one thing. Now it was time to show it. That was the genesis of our starting the nonprofit BEYOND LIMITS: Awaken Your Potential. It’s an organization that believes that Challenge is an Opportunity to be Amazing, that it’s all about the Journey, that Nothing is Impossible, and that We’re Better Together. In 2015 a group of us did what many said was impossible: a team including me (a person with paraplegia) summited Katahdin. It was a fantastic, transformational experience for everyone involved. People carried me physically. But in truth, we all carried one another and supported one another. This had such a profound impact that we knew that we needed to do something that could involve more people. And thus the BEYOND LIMITS Appalachian Trail Adventure was born. We started planning in earnest in October 2015. It takes time for anyone to pull something of this magnitude together. And Saint and I had additional special needs and considerations. We were going to need to recruit teams along the way—to whom should we open this up and how? What should the criteria be? How should we select people? What was the “Right Stuff”? We needed people who were in adequate shape and health. Yet the most important attributes were mental. It took a while to compile position descriptions. 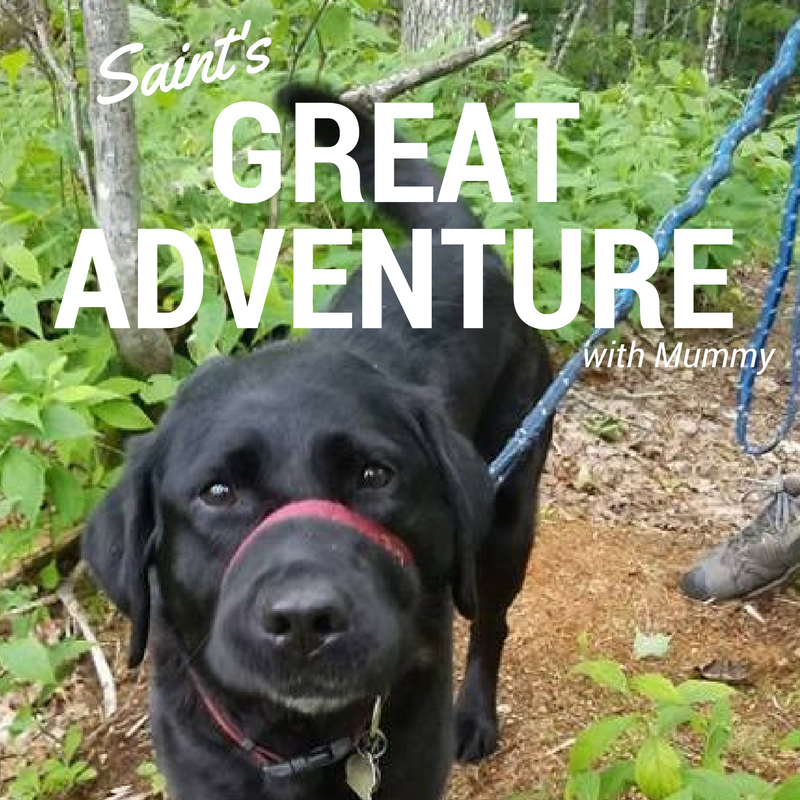 We asked the group members who were involved in the Katahdin climb what they thought. They talked a lot about the need to be humble, open-minded, team oriented, have an even temperament and the posture of a learner, be eager to take part in something greater than oneself. When we were recruiting for Katahdin, Mike Smith said that people should want to participate even if no one would ever know that they in particular had done so. To a degree, people self-select. Largely, only the right type of person will want to become involved. This is no path to personal glory. When we did Katahdin, we had rented a hiking wheelchair and Al Levesque modified/created a carrier. We never used the wheelchair: the ground was too difficult. The carrier worked fairly well but could have definitely used some improvements. The Sherpas were challenged to make it comfortable for them. My pelvis was badly bruised by the third day from the metal plate on the carrying harness into which the seat slid. So Al went back to the drawing board. Originally we thought that we would have help from other institutions. But that didn’t materialize. So Al designed and fabricated everything himself. He planned out his prototypes. He fashioned an improved carrier—dubbed the “Jac Pack”—and a special hiking wheelchair. His hiking wheelchair is unlike anything on the market—it has independent wheel suspension, a shock absorber, brakes. The carrier far surpasses anything out there. And he built these in his woodworking shop, using what tools he had available—not at all the precision tools one would hope for. Then after he had the prototypes fashioned, he was open to feedback from my hiking partner, Hopper. He made a lot of adjustments to the carrier. He made it so that the seat for the carrier could also be the seat for the wheelchair. He made the wheelchair so that it could be broken down into 11 pieces so that it could be carried by multiple people hanging it onto their packs. We have learned so much through this development process. 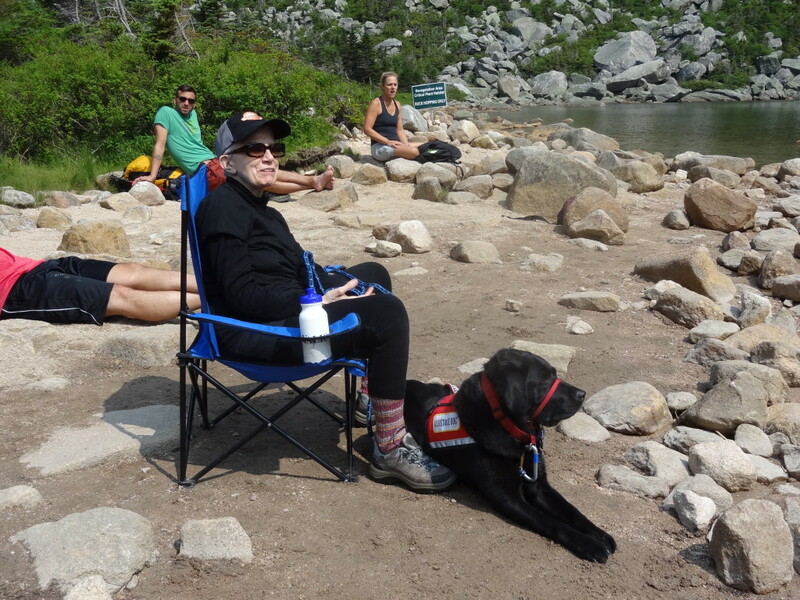 The hike is about ability, not disability. It is about the triumph of the spirit and what’s possible when people come together. It will fulfill so many aspects. A huge piece is to make it possible for people who have been told “can’t” to get out and be able to do things. 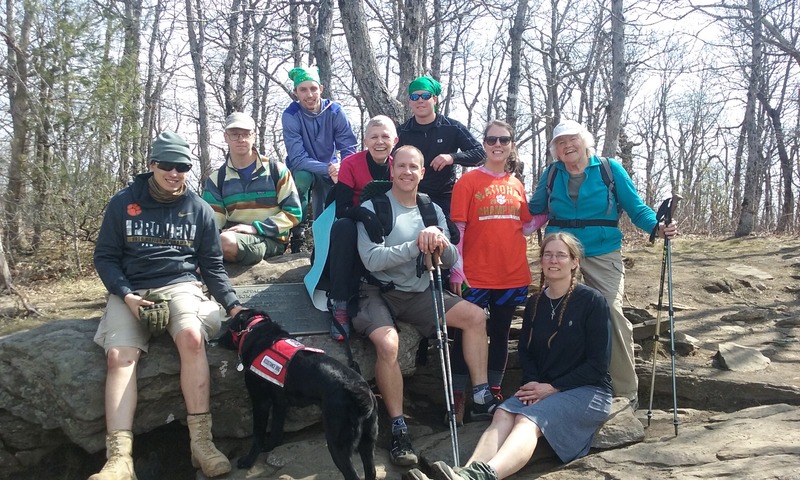 People don’t have to hike the Appalachian Trail—either thru hike or section hike. Even an hour outside in a place that they never dreamed they’d be able to go is a victory. The equipment will also be very useful for search and rescue operations: everything from someone being injured on a hike to people needing to be evacuated from some sort of disaster. We spent a lot of time on logistics. We knew that however much time we spent, it would all be subject to great chance. But for our own sakes as well as others, we had to demonstrate that this would be feasible. We came up with lots of scenarios, lots of gear options, lots of combinations. My students helped so much. They worked on aspects of this for class projects and on their own. We reached out to lots of colleges and universities. I spent the summer of 2016 researching colleges and universities with academic recreation programs or active outing clubs. I sent out hundreds of emails. But many people are away in the summer: I got few responses. My students took a crack at it in the fall. They also had mixed success. It was hard and discouraging for them. They did an awesome job and truly stretched beyond their comfort zones. But it’s hard to market an idea. BEYOND LIMITS and the Appalachian Trail Adventure are much more about ideas than an actual hike. The hike is the hard thing that pulls people together. It’s not about gratifying someone with paraplegia. But that can be hard to explain. The idea had been with me for so long, however. And it just would not let go. So although we had only a few teams lined up as D-Day approached, we were determined to embark and make it work by being flexible and open. We didn’t really realize that the drive south itself would be an adventure. But as Dad used to say, “With you, Jac, EVERYTHING is an adventure.” We’ll share that story in the next installment of our blog.